Find out how top sales professionals gain more opportunities, close more deals and drive more revenue through Social Selling. If you could find an easy way to find qualified sales leads, would you be interested? Would a simple blueprint that can take you from tiresome and soul-sapping cold calls to a place where your ideal prospects proactively engage with you, resonate with you? There’s a solution that’s been right under your nose for some time now that can help you achieve astonishing sales results. It is the most under-utilised lead-generating powerhouse on the planet for B2B sales professionals right now. And, best of all, it’s free. There’s a catch, though. LinkedIn doesn’t reveal its secrets easily. Francois Muscat, who is Social Selling Certified, has spent massive amounts of time and money learning from the world’s top social sellers in the USA and Europe so that he can share that hard-won knowledge with you. He’ll share some of the best guarded secrets with you on his 1-Day Social Selling Mastery Course on 22 July in Johannesburg. Once you’ve completed it, you will be able to emulate the top social sellers so that you too can gain more opportunities, close more deals and drive more revenue. Hello Francois, thank you for the excellent workshop at Black Eagle. I am a novice at this but after your workshop I can certainly see the power behind working LinkedIn correctly. How to find hidden sales opportunities by joining groups. I attended Francois’ Social Selling course on 12 February 2015. He wowed me with plenty of practical tips and skills to be able to optimise and effectively use Linkedin and Twitter. His presentation skills were authentic and he was successfully able to pitch the content at a level that all the delegates could understand. I went away with many action items that I know will aid me in my quest to make better use of the social network space and reaching out to others. I would recommend Francois without reservation as a trainer and consultant to any organisation ready to take its social network media profile and impact to the next level! Francois holds a Masters degree in Information Technology and Digital Certifications in Search Engine Optimisation. He conducts many training days, boot camps and conference presentations ranging from topics such as Social Media, Social Selling, and LinkedIn Networking to Search Engine Marketing and Digital Marketing. He advises organisations worldwide with their digital marketing and social media strategies, developing their digital assets and managing their online reputation. As a baby boomer that enjoys being social, he coaches business professionals on the effective use of social media in developing their personal online brand, amongst others. 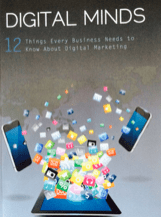 Francois is a contributing author of the book Digital Minds: 12 Things Every Business needs to Know About Digital Marketing, which is now on its second print run.